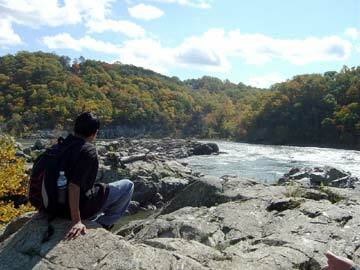 On a school holiday, Mr. Bellino and Ms. Zompa took some of their students on an interesting hike along the Potomac River, not far from school. When they returned to school, some of the students wrote about the day. It was raining before we went to the Great Falls to have some fun, but the sun came out. First we took a group picture together. Then we started to walk to the falls. There were eight students with two teachers. 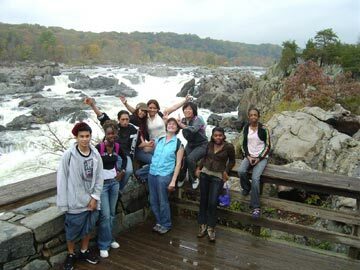 It was my first time at Great Falls and I was having a good time with everybody. I think everybody was having a great time. The water was pretty and I was happy to have fun with other students. It was exciting. I liked it. Some students were taking pictures of the river. Others were sitting on the rocks and others standing and watching the beauty of the river. We rested for a little bit and then we went on. There were people screaming and others jumping onto big rocks, but everybody was having fun. We stopped at the beach to eat. Ms. Zompa was talking to us. We were listening to what she was saying. We started walking again. We were far from the other people behind us. We waited for them and then we kept going again. On the trip we saw a snake. I was screaming because I’m afraid of snakes. Then Mr. Bellino took pictures of the snake eating a crab. Everybody had a good time. I would love to go back there. I thank Mr. Bellino and Ms. Zompa. God bless everyone. Our field trip was on Friday. It was really fun and exciting. First thing in the morning at 8:00 we all met near the cafeteria in the school. Then we waited for the van so we could leave. When we got over there, Mr. Bellino and Ms. Zompa told us a little bit about the place. After that we started hiking. 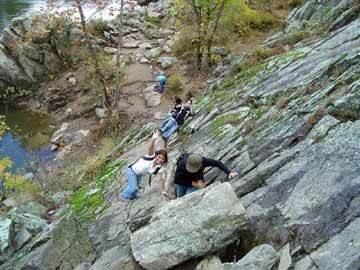 We climbed many rocks. We saw the river and also we ate lunch at the beach. We saw a snake and a deer. After hiking we started walking to the van for like an hour. We started talking about the hike. In the van we listed to music, we talked about many things and we saw some cute boys out of the windows. The hike was fun and we all loved it. I really liked the river, trees, leaves, snakes, the house, and everywhere. I loved walking with the students. That was fun. I forgot to talk to the teachers to say thanks to them. I was so happy. 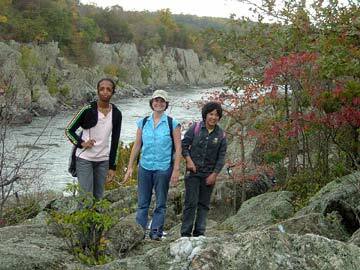 At the beginning of the hike, everyone posed for a photo near Great Falls on the Maryland side of the Potomac River. Hana, Ms. Zompa, and Zhifen pose for a picture next to the Potomac River. 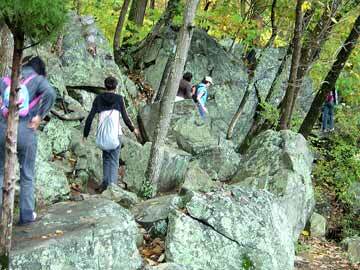 We hiked up and down rocks and through the forest. It was tiring but fun. This was the highest climb of the day. It was a lot easier to climb up than it looked at first. This was one the most beautiful views. It was very quiet and peaceful here. 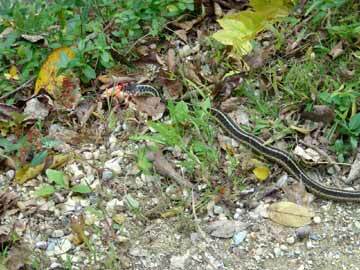 This snake was busy eating a crab and didn't notice us passing on the path.